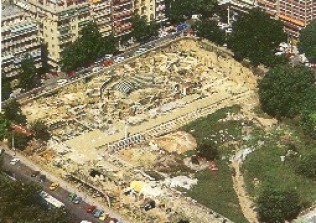 Roman Market and Theatre. (photo) Ruins standing at the Law Court Square (Dikastiria). Nymphaion . 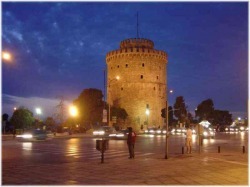 An elegant monopteral, circular building. Vergina, the ancient site of Aigai and the first capital of Macedonia has extensive ruins including the tomb of Phillip and the summer palace of King Antigonas Gonatas. Open from Tuesday to Sunday from 8:30 to 3:30 but stays open until 7 in the summer. The Rotonda , a domed building of early 4th century A.D., served as a Pantheum or as a Mausoleum for emperor Galerius.Now the church of Saint George. Was a mosque during the Turkish occupation and the minaret still stands. 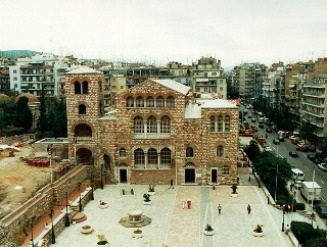 Church of Ossios David (late 5th century A.D.), the chapel of the Latomos Convent , an early Christian church that still stand in Thessaloniki's Turkish quarter known as Epimenidou or Kastra. Agios Dimitrios , (photo) was completely rebuilt in 1948 according the original plans. The church has been destroyed twice before by fire. The Crypt , the most easterly section of the Bath, is the place where St Demetrios was imprisoned, tortured and buried. Panagia Halkeon , a cruciform church, was built in 1028 A.D. according an inscription of that era.